Thin wooden batons screen the glass facades of this new building that architects Elmar Ludescher and Philip Lutz have added to the 50-year-old Högl winery in Lower Austria (+ slideshow). 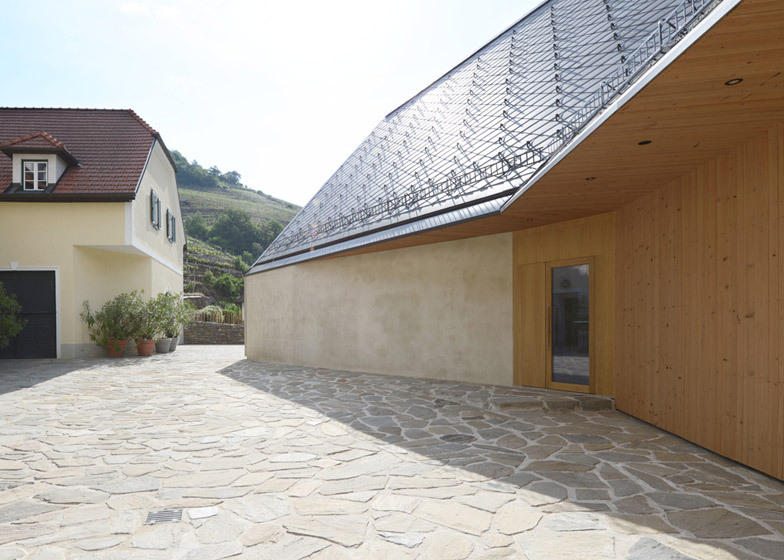 The wine-tasting and production room completes the outline of a courtyard at the Högl complex, which is located at the outer western edge of Austria's Wachau region – a UNESCO heritage area specialising in the production of dry white wines. Ludescher and Lutz, both based in Bregenz, wanted the design to combine local craft traditions with contemporary forms. The aim was to create a building that is akin to the existing structures on the site, but also visibly more modern. They chose thick plaster for the walls, while the steeply pitched roof is covered in diagonally oriented tiles. 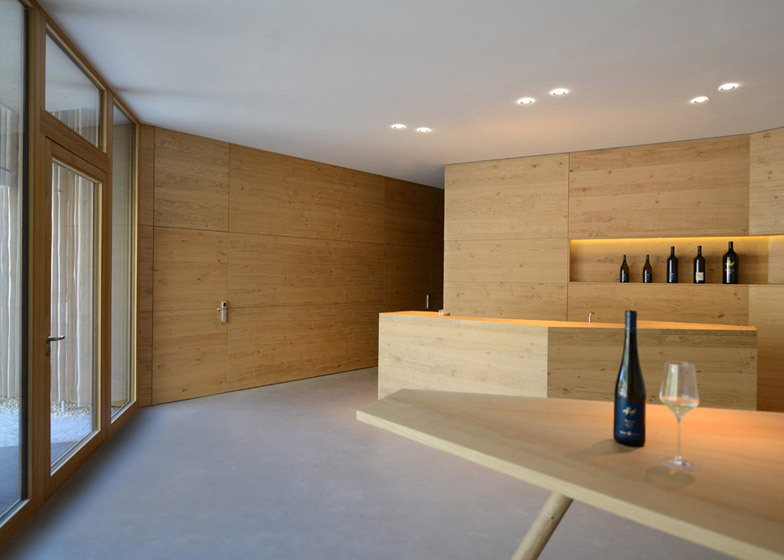 Windows are covered with slender strips of white-washed timber, allowing light to filter in gently and permitting views of the nearby vineyards. 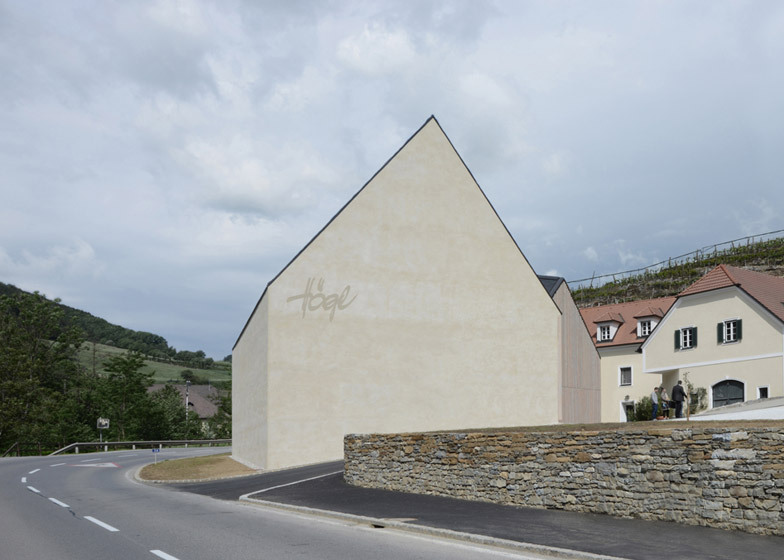 "The house is consciously seeking to integrate itself into the historically grown material language of the Wachau," said the architects. "Glass surfaces are shielded by tight and whitewashed wooden slats that show the unevenness of their growth," they continued. "The roof is a contemporary version of a classic style that has deep roots within the region's tradition, dating all the way back to the monarchy." The building has a three-winged plan, with several gabled end walls. Located on the edge of a road, it stands alongside a row of existing winery buildings to frame a courtyard and shield it from the street. Guests to the winery are welcomed by the timber-screened glass facade – the end wall of one of the building's three wings. 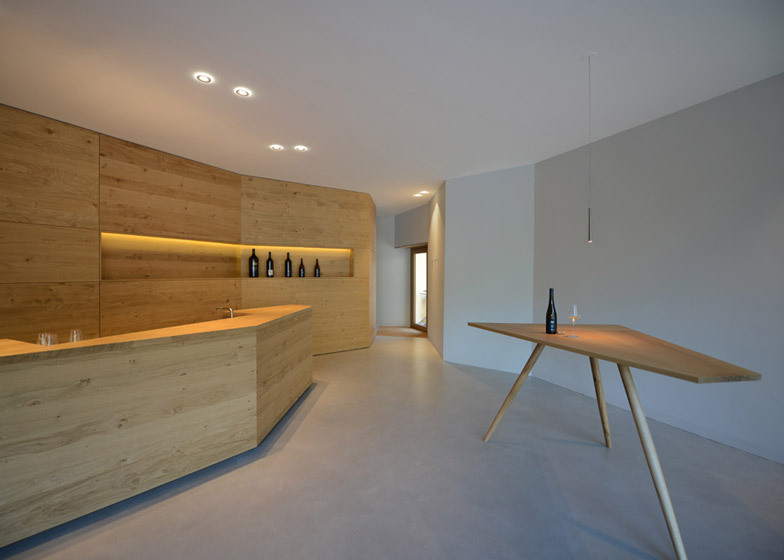 This entrance leads through to the timber-lined wine-tasting hall. A smaller gated entrance at the opposite end of the courtyard leads through to the production facility. The building is the latest in a series of new visitor facilities for wineries around the world, as companies capitalise on the popularity of wine tourism. 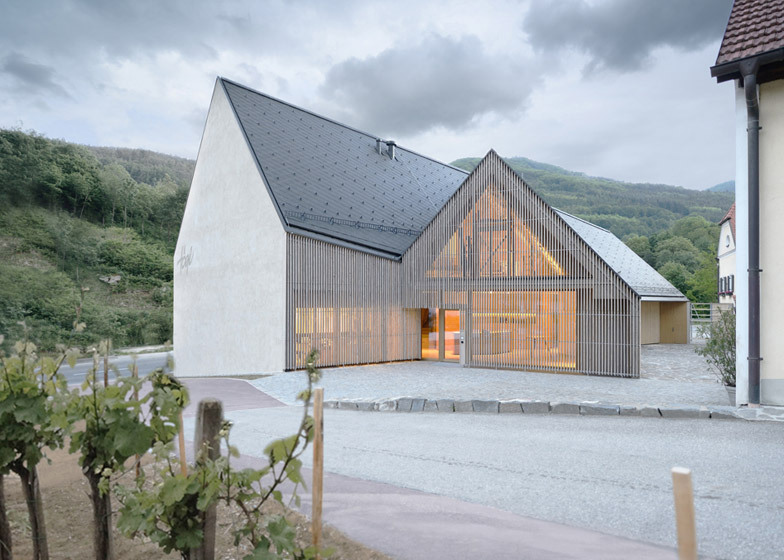 Architects including Foster + Partners and Jean Nouvel have both recently extended estates in France, while new buildings have also been added to the Cloudy Bay winery in New Zealand and the Bodegas Protos winery in Spain. 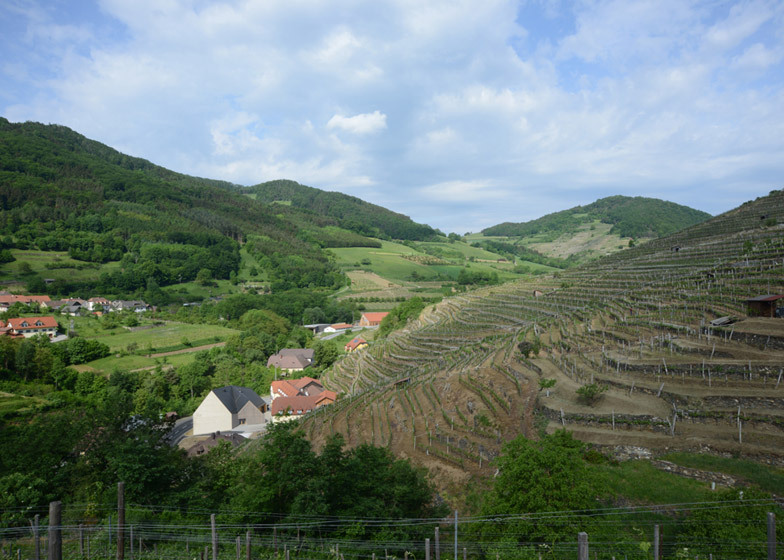 The Högl winery is best known for its Riesling and Veltliner wines, thanks the region's cool climate and fertile schist soil that allows both grape vines and apricot trees to flourish. 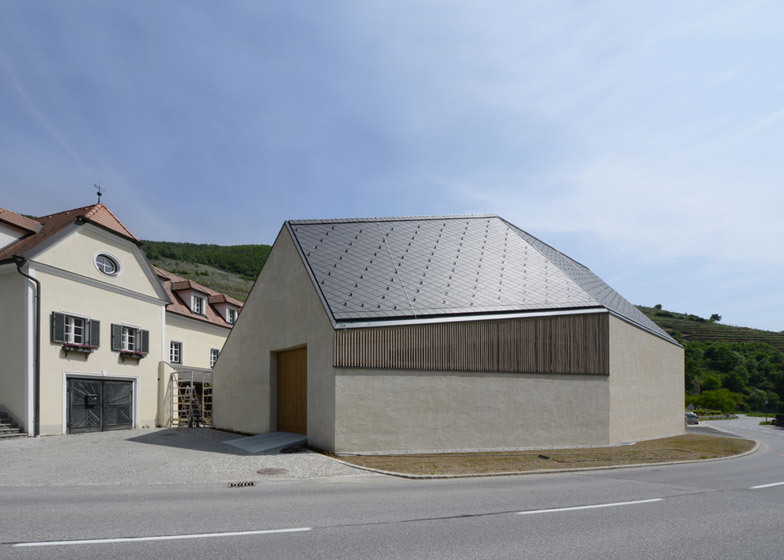 "In its distant effect the project aims to integrate itself into the grown cultural landscape of the Wachau," added Ludescher and Lutz. "It only becomes clear at a second glance, that it is an alienated sculptural structure which reflects the high art of winemaking in an abstract form."